Our attention has been drawn to the desperation of some elements working for a particular political party within our society to tarnish the image of the President of Christian Association of Nigeria, Pastor Ayo Oritsejafor. They are working for the All Progressives Congress and they are not unknown to us. Let Nigerians have this background for them to judge themselves. These shameless characters including a former Minister of the Federal Capital Territory (FCT), Nasir El-Rufai and National Publicity Secretary of All Progressives Congress, Lai Mohammed, went to UK to embark on an image laundering for their political party, the APC. El-Rufai had once said there are three sets of Boko Haram in Nigeria: Islamic Boko Haram, Politicians’ Boko Haram and Christians’ Boko Haram which he said are being funded by President Goodluck Jonathan and coordinated by CAN President, Pastor Ayo Oritsejafor. He went further to claim that the CAN President has been given N50 billion by the President and a Jet. The same characters, went head to sponsor a negative report in Saharareporters. I had expected that by now no sane mind will take any report by Saharareporters serious because it is an online news medium which thrives on falsehood and survives on false propaganda and blackmail. The aircraft in question is owned by Eagle Air Company and the CAN President is an interested party in the company. Since August 2 2014, this Aircraft has been leased to Green Coast Produce Limited. They lease this aircraft and people rent it from them. Anybody in this country will attest to the fact that Pastor Ayo Oritsejafor has been following Chartered Airlines. All investigations about the plane should be directed to the management of Green Coast Produce Limited, a duly registered company. Further enquiries about this should be confirmed from Eagle Air Company which leased this Aircraft. El-Rufai has accused Jesus Christ severally in recent times. El-Rufai and his group met and decided to launch a blackmail against Pastor Ayo Oritsejafor because he is an ardent supporter of President Goodluck Jonathan. This, he did, to elicit sentiment from the society. We want Nigerians to ponder over this: if Nigeria wants to buy arms, the government knows where to get their weapons. How did Pastor Ayo Oritsejafor come into this? The report is a well-organized orchestrated plan, all because of their desperation for the 2015 general elections. If not for the blindness and intellectual myopia of some Nigerians, people in the calibre of El-Rufai shouldn’t be taken seriously and should not be walking on the streets. This was the same El-Rufai abusing Gen. Muhammad’s Buhari (retd) and ex-President Olusegun Obasanjo, calling them all sorts of names. El-Rufai is more of a Street Boy whose history and antecedents are very much known. He has been the person defending Boko Haram and this is an opportunity for him to hide his misdeeds. We are waiting and we can assure you that at the appropriate time, he and his allies will pay dearly for it. The international community sees APC as an Islamic party; instead of El-Rufai to deny that, he was busy orchestrating spurious propaganda against Pastor Ayo Oritsejafor. 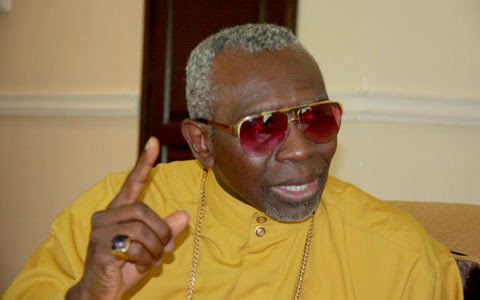 The public should also not forget that it was Pastor Ayo Oritsejafor who went to the United States’ Congress and suggested that Boko Haram Islamic sect should be domesticated as a Foreign Terrorist Organization (FTO). It is the same El-Rufai who is accusing the CAN President as the person behind Boko Haram.